It seems like the same and people get confused in these words. Both are related to finance but the target market for both is different. Micro finance is specially framed for the need of an individual, a small industry or any type of small business unit. Macro finance is designed for the large section of the economy like big business corporations or a whole economy. A micro finance is a narrow concept which includes the various services like micro credit, micro savings, micro insurance and many more schemes. The purpose of micro finance is to help the small section of a society like low-income level people or a below poverty line who are not able to serve their needs just because of unavailability fund. Those who are not able to take a financial help by the conventional way of putting a security as a guarantee. A micro finance helps people to start their own business by proving finance with a low rate of interest and help to make them independent. Macro finance is a broad concept and works on a large scale and its advantages are widespread. 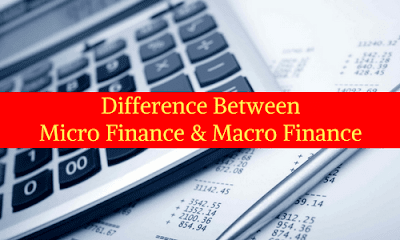 Macro finance is an initiative which deals with the large section of an economy and covers all the financial need and how to provide it to the needed one. A macro finance includes the drafting policy, subsidies, multi-year expansion plans. The main aim of macro finance is to help an economy to grow and to generate employment and expand an economy. A government provides macro finance in any form to the business like tax benefits or a subsidy because it will benefit the economy in future. Meaning Micro finance is an individual based concept to furnish financial services to low-income individuals who have no access to finance in a conventional way. Macro finance is a whole economy based concept, which is not framed for any particular group, to grow the economy at a national level. Concept A micro finance is a narrow concept and focuses on the need of an individual. A macro finance is a broad concept and focuses the whole nation. By whom A micro finance is provided by micro finance companies, self-help groups, and non-government organizations. A macro finance involves a large entity like governments, big corporation, banks, and some big private lenders. Money involved In micro finance, the money involved is in a small amount. The amount of money involved is in a large portion. Time period A micro finance is an endless activity which goes on and on. A macro finance is for a specific time period like 2 years or a 3 year. It means it has a predefined tenure. Risk level In a micro finance, there is a risk of default that an individual may not pay. There is no risk at all because the main aim is to give benefit to the economy. Effect A micro finance has a direct effect on an individual. A macro finance has a direct effect on the whole economy which indirectly affects the whole population.